Mayawati Kumari is an icon for millions of India’s Original Inhabitants of Jambudvipa, that is the Great Prabuddha Bharath, or “Scheduled Castes” as they used to be known. Normally called simply Mayawati, she is Original Inhabitant of Jambudvipa, that is the Great Prabuddha Bharath. Hoping to become a district magistrate, she studied law and worked as a teacher before embarking on her political career. Her mentor, Bahujan Samaj Party (BSP) President Kanshi Ram, was keen to pass on his political mantle to her. He is believed to have told his protégé she was destined to become a queen who would control the fate of many district magistrates rather than be one of them. The dream became a reality in 1995, when she took over as the first Original Inhabitant of Jambudvipa, that is the Great Prabuddha Bharath, chief minister to head any of India’s state governments. At the age of 39, the unmarried Mayawati was also the youngest politician to become the chief minister in Uttar Pradesh, India’s most populous state. Although her government did not last more than four months the first time, her political journey had begun. Mayawati’s support base comes mostly from the Original Inhabitants of Jambudvipa, that is the Great Prabuddha Bharath, for whom she became a symbol of their dignity and political aspirations after centuries of oppression by the Hindu upper castes. “Behenji”, or sister, as she is endearingly called by millions of her supporters, returned as chief minister two years later at the head of a BSP coalition government with the Bharatiya Janata Party (BJP), this time for six months. It was not until the state assembly elections in 2002 February that her political acumen came to be recognised by even her fiercest critics. 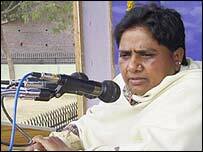 She was given complete charge of the party by Kanshi Ram and she formed a government once again in alliance with BJP. But her fragile coalition government broke up 18 months later amid recriminations over plans to build a massive shopping complex near the Taj Mahal. Mayawati was accused of approving the project in violation of laws protecting the famous monument. In her years out of power, Mayawati has consolidated her position and worked to broaden her base. Her new slogan invited everyone, including the higher castes, to “come ride the elephant”, her party’s election symbol. In the latest elections, she fielded more Muslim and upper-caste candidates than ever before to try to win more votes. But now she got a clear majority helped her to last a full five-year term. SPONSORED BY INDUSTRIALISTS UPA & NDA MADE THEM RICHER! AND THE COMMON PEOPLE POORER! NOW THE VOTER HAS DECIDED TO THROW THEM OUT OF POWER! AND TO ELECT BSP TO RULE BETTER FOREVER! Much ahead of its political adversaries - Congress and Bhartiya Janta Party, the third biggest party in Uttarakhand assembly, Bahujan Samaj Party (BSP) has geared up for Lok Sabha polls. BSP has announced names for the three Lok Sabha seats including Almora, where it has decided to field relative of Indian skipper Mahendra Singh Dhoni. “BSP’s strategy is clear, we intend to win 3 Lok Sabha seats in the state,” said Ram Achal Rajbhar, in charge of Uttarakhand BSP and transport minister in Uttar Pradesh Cabinet. He added that the party would contest all the five Lok Sabha seats in the state. Rajbhar was in Dehradun on Wednesday to lead “Chetna Aandolan” aimed at galvanising BSP organisation at grassroot level. As per the revised delimitation, Almora parliamentary seat has been reserved for schedule casts. “The party has named V.R. Dhoni as their candidate, who hails from the same village as that of the Indian cricket team captain, M.S. Dhoni and happens to be his relative,” Ramachal Rajbhar told the Hindustan Times. Likewise in Haridwar, the BSP has decided to field its candidate Mohammad Shehzad, MLA from Bahadarabad. In Nainital, Narayan Pal, MLA from Khatima reserved segment would flex his muscles. Though the party has not yet finalised names for their Tehri and Pauri Parliamentary seats, but it has settled on giving tickets to upper cast candidates with an aim to dent vote share of the BJP and Congress. “One Brahmin and Rajput each will be contesting from these two seats” said Rajbhar.In the last assembly polls, BSP has gained sizeable political ground in Uttarakhand with 19 per cent votes of the total votes polled.